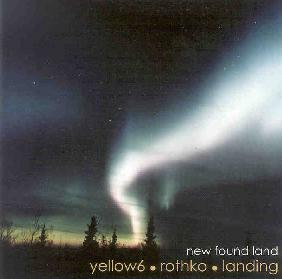 Yellow6/Rothko/Landing - "New Found Land"
New Found Land is a moody odyssey into deep and unexplored places. Each of the contributing artists has delivered 5 - 7 pieces of varying moods and textures for this split CD. Yellow 6 is, for the most part, the solo work of Leicestershire, UK’s Jon Attwood (he does play live with some other musicians). The 5 tracks he brings to New Found Land are the strongest of the bunch. Beautiful and mysterious compositions of gently ebbing melodic atmospherics, softly picked acoustic guitars, droning electric guitars, and very subtle touches of electronic percussion provide a soundtrack for the shadows of twilight. Especially effective is the almost 10-minute long Silhouette, with it’s restrained keyboard melody that haunts long after the piece is over. Originally a three bass trio, UK’s Rothko is now basically Mark Beazley and a rotating roster of musicians with whom he collaborates, who play various instruments. As you may imagine, the 7 instrumentals he offers on New Found Land (titled Half Tones and Meta Tones 1 - 7) are moody bass explorations, definitely steering toward the more experimental side of ambient music, often with layers of noise that float past you like electric ghosts. I wouldn’t say any of the 7 parts stands out above the others, but they all work together to form a slow and creeping journey into darkness. Connecticut, US’s Landing contributes the last third of the split. In the vein of last year’s Seasons album, these five pieces are laidback, exploratory avant pop tunes. I must admit though, I was a little surprised by the sudden inclusion of vocals on three of the pieces, after 45 minutes of purely instrumental music. While the mood of Landing’s pieces certainly follows through from Yellow 6’s and Rothko’s contributions, I would have preferred the album to remain instrumental. The vocals, as beautiful as they are (Aaron and Adrienne Snow’s voices work particularly well together), seem to give the album as a whole a bit of lopsided feel. But just a bit. All in all, they are some of the best songs Landing has ever done. While listening, I got the feeling of walking through a twilight land with the Yellow 6 pieces, whereas the Rothko tracks took me into the deep, and sometimes frightening night. Landing was the redemption, as mist flowed across the lake, and the first rays of sunlight began to touch the eastern horizon. It was the dawn of my first day in the New Found Land. Yellow 6’s web site is at: http://yellow6.com. Rothko’s web site is at: http://www.rothkomusic.co.uk. Landing’s web site is at: http://www.landingsite.net.